GOLD Coast rookie Tyrone Downie will be forever grateful to an extinct football club for unexpectedly kickstarting his AFL career at the age of 26. Downie was the subject of a small milestone during the NAB AFL Rookie Draft on Wednesday, when he became the first and last player recruited from defunct VFL outfit Bendigo Gold. The Suns handed the athletic forward his chance with their final pick, No.59 overall, completing a whirlwind three weeks since he was first contacted by recruiter Dom Ambrogio. Rewind 12 months and that scenario could hardly have seemed more unlikely. A star player/coach of Bendigo Football League club Kangaroo Flat, Downie had only just signed with the local VFL team – which was waging a public battle for survival due to financial problems. The Gold folded in August, but one season back at VFL level – after injury ruined his first attempt in 2007 – was all it took for Downie to flash across the Suns' radar. 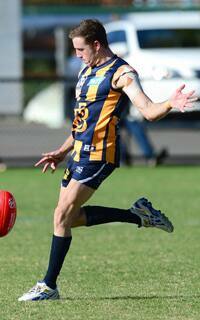 The strong-marking 182cm forward slotted 31 goals for Bendigo, including bags of four against Williamstown and Box Hill, despite the club failing to win a match and averaging only eight goals a game in 2014. Still pinching himself that his AFL dream has come true, Downie paid tribute to coach Aussie Jones and chairman Tim Dickson for fighting to keep the Gold afloat last season. "Aus and Tim, I've thanked them dearly. If they hadn't kept the Bendigo Gold up and running this year – and everyone else that did their bit - I wouldn't have been given this opportunity," Downie told AFL.com.au. "I definitely didn't expect this to happen and it wasn't the reason I went to play with the Gold - it was just to have a dip at VFL footy and to play the highest standard that I could in Bendigo. "With them having a young list, being an older guy appealed to me too and I just wanted to go back to VFL and have a real crack." When Gold Coast contacted Downie he had already started pre-season training - having agreed to play for Richmond's VFL team next year - and he jumped at the chance to run a time trial and undergo a searching medical examination of his history of foot and knee inflammation. The Suns offered no guarantees they would pick him up, but his on-field leadership and mature body made him an appealing prospect. "I guess they brought me in as an older guy with a bit of coaching experience to help their younger draftees and younger players in the NEAFL as well as hopefully, if I'm playing well, fill some holes on the AFL list if they arise," Downie said. With new coach Rodney Eade widely-tipped to lead the Suns to a breakthrough finals campaign next season, Downie knows it won't be easy to get a senior game – but he's desperate to make the opportunity count. "They said there's going to be opportunities there if I'm good enough," he said. "Obviously I've got to go up there and work hard – especially early – and try to prove that I'm up to the standard. "In the back of everyone's mind they've got the dream of playing AFL footy. I always wanted to do it, but didn't expect it and I'm stoked now to get that opportunity."